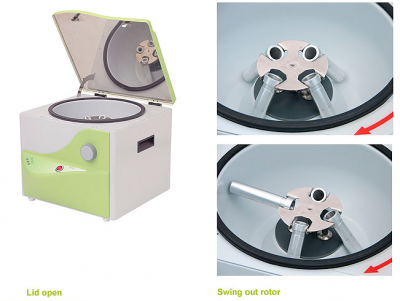 This interlocked Centrifuge is constructed with a steel body with fourplace swing out rotor complete with removable aluminum buckets. The safety interlock, prevents the lid being opened until the rotor is at rest. In the case of power failure the lid remains in the locked position. The product can only be operated if the lid is correctly closed and locked in position. Viewing window in lid for observing rotor. Features and Benefits:1. Spillages are contained within a gulley in the centrifuge bowl where the Rotor is spinning to contain spills. 2. To assist cleaning the Rotor buckets are easily removed from the rotor by lifting clear, allowing easy access and cleaning in working area of the Centrifuge. 3. Removable buckets allows easy cleaning or to be autoclaved. 4. Preventing debris leaving the Rotor area, a rubber seal provides a barrier when the lid is locked in position. The stainless steel inner lid which seals the Rotor bowl, provides an easy wipe clean surface. 5. Fitted with non-slip rubber feet for safety. 6. Fitted with an IP rated clear booted on/off mains switch at rear bath preventing ingress of moisture. 7. Sturdy construction - powder coated exterior providing a durable chemical resistant. 9. Recessed side lifting handles for ease of transportation. 10. Broad range of accessories available to suit wide range of applications - see accessories below. Uniquely identified with its own serial number recorded on our product database, which includes all of its manufacturing inspection data. Checks are made on each unit running at maximum speed, interlock operation and rotor balance. 12. Carries the CE mark meeting the requirements of Low Voltage and EMC Directives.